Some people don’t seem to comprehend that the name "Syria" is derived from "Assyria"! Where in addition to the fact that it was the Greeks who called Assyria as Syria, because their letter “Sigma” corresponds to the Phoenician letter “Sheen” from which they took their alphabet. Noting that the Greeks have a letter “Xi” which corresponds to the Phoenician letter “Simkat” (or “S”), they could have used it and Syria’s name would have ended up as Xiria (or Xyria). But they didn’t because they were very accurate in using the correct letter “Sigma” because it corresponds to the “Sheen” of Ashur. Some people wonder what happened to the first letter “A” in Ashur (or Assur)? They try to use that as an excuse to discount the above! Well it is a common practice in Semitic languages to drop the vowel at the beginning of the word; we say "Spani", instead of "Espani" (Spanish), and "Fransi", instead of "Efransi" (French), and with the same token "Syria" form "Assyria". Recently I was reading an article, and the answer popped in front of my eyes! It was always there, but no one had noticed it! So here it is, all I needed to do is put one and one together! The Greeks refer to the Assyrian Queen "Shamiram" as "Samiramis", notice how the Assyrian “Sheen” had turned into the Greek “Sigma” too, however here the name of Shamiram didn’t have an “A” at its beginning. But here is an example of an Assyrian name that starts with an “A”! What is amazing is that Greeks refer to the Assyrian King "AshurBanipal", as "Sardanapalus" (Sardanapal for short, where the “-us”, “-os”, or “ous” suffix is added at the end of names of males in the Greek language). 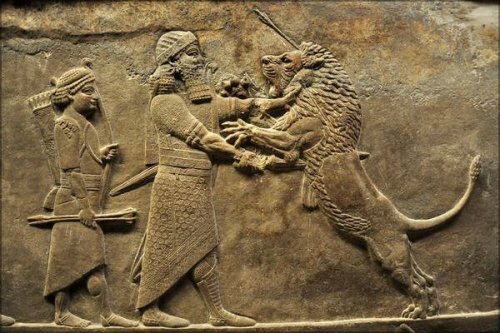 Notice that the original full Assyrian name is actually Ashur-Bani-Aplu, (meaning Ashur-created-a-son), and in Greek it corresponds to Sar-Dan-Apal-us. Notice that here too the Assyrian “Sheen” was replaced with the Greek “Sigma”, but what is more interesting is that the “A” was dropped from the beginning of the name! Technically the name would have been "Asardanapalus". This further proves that the name of “Syria” was originally but “Ashuria”, (i.e. it was derived directly from the Assyrian source, from very early times, when the Greeks in Asia Minor were in contact with the Assyrian Empire). Add to that the fact that Assyrians were allies with the Trojans as mentioned in the writings of the Greek historian Herodotus.